Sicario: Day of the Soldado (titled Sicario 2: Soldado in the UK) is a 2018 American crime-action film directed by the Italian filmmaker Stefano Sollima and written by Taylor Sheridan. 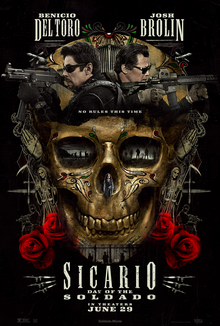 A sequel to 2015’s Sicario, the film features Benicio del Toro, Josh Brolin, and Jeffrey Donovan reprising their roles, with Isabela Moner, Manuel Garcia-Rulfo, and Catherine Keener joining the cast. The story relates to the drug war at the U.S.-Mexico border and an attempt by the United States government to incite increased conflict among the cartels. The investigations into a terrorist attack by Islamic suicide bombers in a Kansas City grocery store, leads the United States government to respond by authorizing CIA agent Matt Graver to apply extreme measures to combat Mexican drug cartels who are suspected of having smuggled the terrorists across the border. United States government responds by authorizing CIA agent Matt Graver to apply extreme measures to combat Mexican drug cartels who are suspected of having smuggled the terrorists across the border. and stage a fake rescue with the help of the DEA and local police, trying to make her think she was kidnapped by her father’s enemies. They take her to Texas where Gillick bonds with Isabel and the team makes plans to transport her back to Mexico. They plan to leave her in territory controlled by her father’s rivals to further escalate the inter-cartel conflict. However, after they cross into Mexico, the Mexican police escorts double-cross them and attack the American vehicles. Graver and his team kill 15 Mexican policemen to escape the ambush. Isabel runs away in the chaos and Gillick follows her Meanwhile, the American government determines that at least two of the suicide bombers in Kansas City were actually domestic terrorists, not foreign nationals, and thus were not smuggled into the United States by the cartels. To quell tensions with Mexico, the Secretary of Defense orders the CIA to abandon the mission. Isabel, having been a witness, is the Secretary orders the team to erase all proof of American involvement by killing Isabel and Gillick. Graver in turn orders Gillick to kill Isabel, but Gillick refuses and turns rogue to keep her alive. Graver and his team fly covertly into Mexico using a GPS tracker hidden in Isabel’s shoe while Gillick disguises himself and Isabel as illegal immigrants and pays human traffickers to help them reenter the United States. However near the border, Miguel, a young Mexican-American who has been recruited as a coyote, recognizes Gillick from an encounter in a Texas parking lot two days earlier. He alerts his boss, and Gillick and Isabel are captured. Miguel is forced to shoot Gillick, and the gang leaves him for dead. Miguel however is fed up with the gang and leaves them to go back home. Graver and his team track down the Mexican gang and kill them all. Graver decides to bring Isabel back to the United States and put her in witness protection rather than follow his orders. Meanwhile, Gillick regains consciousness and discovers he has been shot through the cheek. He finds the dead gang members and their cars, takes a car, and drives for the border. One year later, Gillick has recovered from his injuries. He locates Miguel at the mall and tells him they are going to have a talk about Miguel’s future. It’s not as good as the first one but I also thought that the first film was boring in most parts. This one though didn’t have the same stylized impactful scenes which I thought the first one did. Confused? While Soldado was more fast paced it didn’t feel as impactful as the original film. The girl who plays Isabel, Isabela Moner, I thought was really good. Brolin and Del Toro were their usual high standards for acting but there was so much more that I felt we could have gotten from such a film. 7 outta 10 for me! Once Alex Iwobi’s strike deflected into the bottom right corner off defender Terence Kongolo, the visitors rarely looked like relinquishing the points in Yorkshire. Alexandre Lacazette’s tidy finish from Ainsley Maitland-Niles’ cross ensured victory despite a late Huddersfield fight-back. After Iwobi and Lacazette had squandered chances to increase Arsenal’s winning margin, Adama Diakhaby and Laurent Depoitre both went close to scoring for the hosts. And while Saed Kolasinac’s own goal represented the Terriers first, in 597 minutes of football, it was not enough to retrieve a point. Huddersfield remain marooned at the bottom of the table, 13 points from safety with 12 games remaining. Arsenal arrived in West Yorkshire in the middle of an indifferent period of form, with three defeats in seven outings during 2019 underlining long-standing defensive issues. Unai Emery’s side was able to brush off the absence of top scorer Pierre-Emerick Aubameyang and win without being at their best. In attack, Arsenal’s thrust was generally provided down the flanks courtesy of right wing-back Ainsley Maitland-Niles and team-mate Kolasinac on the opposite side.